I want to start off by saying if you think there is a burglar in your house and you are able to retreat to a safe area to call the police that is what I recommend. I would only be a fool to try and teach you how to “safely” clear a building in one day; much less a written blog. The police do this every day and they would probably enjoy the opportunity to do it. However, there are many situations that could present themselves where seconds count but the police are minutes away. Or you have no phone service, you are trapped inside with the burglar, or the burglar is going to get to something sensitive that you can’t let get out. Whatever the situation, I’m going to give you a few simple pointers if you have to handle something on your own. Please keep in mind these are not sure fire techniques and if you want to be Rambo you need to consider the possible consequences long before this situation presents itself. Secondly, you will need a flashlight mounted on your 12 guage shotgun so when you point it in the dark you can clearly see what you are aiming at. This should prevent you from shooting someone in the wrong place at the wrong time or a pet. This may seem like a lot but as I stated earlier. Now is the time to decide if you want to be the person who takes matters into his/her own hands. If you are then now is the time to properly prepare. Here’s the basics when you enter a structure: If you stand in a doorway (day or night) the backlight around your body creates a perfect target for a bad guy to just destroy with guns, knives, rocks or anything else he wants to aim at you. So when entering, spend as little time in the doorway or near a window. That means you should be moving at the speed of light when you pass by them. Or at least 1500 feet per second. The TV programs that show people duck behind couches are just TV shows. Couches don’t stop bullets. If you are being fired at you may want to be behind something solid. A partner going into a building can turn out to be your worst enemy if the 2 of you haven’t already rehearsed this scenario. I recommend the partner stays out of it or goes first. This way you are safe. I have had partners do some of the craziest things when it gets hectic. I have been grabbed in a sort of hugging manner so they could use me as a shield and I have had them dive at the ground and grab my feet. Don’t laugh because you could be that guy. Nobody knows what they will do under pressure, but my point is that sometimes a partner can get you hurt. Some of them just get shaky behind you and their weapon goes off by accident. Not a good thing but lucky for me that has never happened in my career yet. Another aspect of preparing for this situation is just walking your residence at night. Visualize the situation. Visualize where you would hide or what you would do if you were a bad guy and try to fix that area to make it inconvenient and disadvantageous for him. Walking the house or business at night will show you new shadows and angles you normally wouldn’t see in the day. Keep in mind however, this situation could happen in the middle of the day which will present different challenges. Keep in mind a bad guy that takes a good position in your home can sit and wait for you. When you come walking through with a light you could be easily ambushed. It is just about impossible for you to walk through the building with a flashlight undetected but you should try to be as quiet as possible to see if you hear anything from the bad guy or bad guys. This way you could pinpoint their location and multiply your chances at success. (On that note. Keep in mind there could be multiple invaders. Just because you catch one doesn’t mean others aren’t about to ambush you). 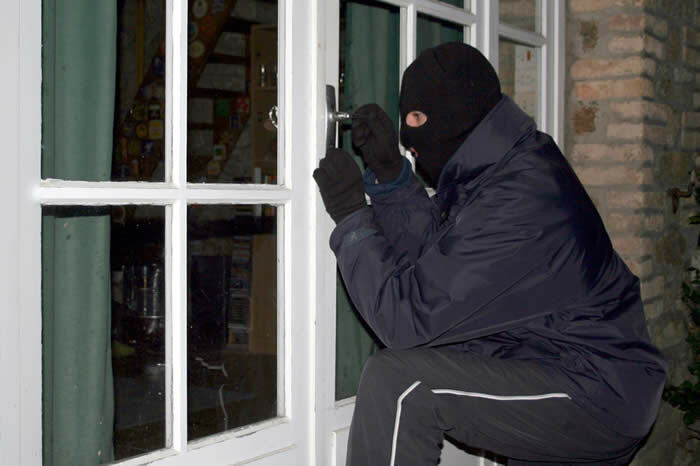 If you are in the residence when the intruder comes calling you are best to get on the phone with authorities and tell them you are in the house and you will remain there until they arrive. Of course, as mentioned before, you may not have a phone or they could be going for sensitive information. In that case I hope you have followed my advice: PREPARE PREPARE PREPARE!! I hope this limited information hasn’t excited you because my goal here is really to convince you against ever having to do this sort of thing. My one last idea on this subject is that when you leave you should always leave everything situated exactly the same. This way if a different light is on when you pull into the driveway you can just avoid the whole situation and call for backup. If you walk inside and a door is open that should have been closed you can back out and call for backup. Letting a professional handle something should not be considered an affront to your abilities. It’s just smart. I value human life above anything else so for me in this situation, I would do everything I could to avoid any confrontation. A simple alarm would be great. I have advised on getting a guard dog in a previous blog. I am going to continue this blog next week with a part 2 of “Catching Intruders”. Next week it will be about catching spying devices in your home or business. ← What’s in Your Drink?